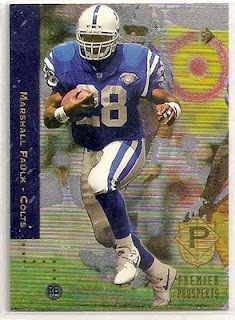 The Indianapolis Colts had used their second overall pick in the 1994 NFL draft to choose RB Marshall Faulk of San Diego State, a fast 5’10”, 207-pounder with toughness and solid receiving skills. Faulk wasted no time in having an impact as he led the Colts to a big win in the season opening game on September 4, 1994 against the Houston Oilers at the RCA Dome. Indianapolis, coming off a 4-12 record in ’93, had not only added Faulk, as well as LB Trev Alberts, in the first round of the draft, but had also revamped much of the team. In taking on the Oilers, Head Coach Ted Marchibroda’s club was up against the defending AFC Central champions, but Houston was a team in transition, especially having lost QB Warren Moon by a trade to the Vikings, G Mike Munchak to retirement, and defensive ends William Fuller and Sean Jones to free agency (gone also was defensive coordinator Buddy Ryan, who had openly feuded with offensive coordinator Kevin Gilbride). Faulk opened the scoring late in the first quarter on a one-yard run, following a series in which the Colts drove 47 yards in seven plays and the rookie running back carried the ball on six of them. Indianapolis ripped the game open in the second quarter. First, LB Tony Bennett recovered a fumble by Houston QB Cody Carlson and returned it 75 yards for a touchdown. On their next possession, the offense moved 56 yards in eight plays capped by a touchdown pass of four yards from QB Jim Harbaugh to WR Floyd Turner. Houston’s WR Travis Hannah fumbled the ensuing kickoff, which was recovered by the Colts at the Oilers’ 22 yard line, and five plays later Harbaugh connected with Turner again for a nine-yard TD. No sooner did the Houston offense get on the field when, on the first play, Carlson threw a pass that was intercepted by FS Ray Buchanon, who returned it 22 yards. It took just four plays for Faulk to score his second touchdown of the game, running up the middle from two yards out, and the Colts went into halftime with a 35-0 lead. The 28-point second quarter tied a club record (since broken). Faulk led off the second half scoring ten minutes into the third quarter with an 11-yard touchdown run before Houston finally scored three late TDs. The final tally was 45-21. Faulk ended up running for 143 yards on 23 carries with three touchdowns in his regular season debut. He also caught one pass for 31 yards, which was the longest pass play of the day for the Colts (who didn’t have much need to go to the air) and made him the team’s receiving yardage leader for the game. Jim Harbaugh, a veteran free agent signee from the Bears, completed 9 of 12 passes for 105 yards with two TDs and an interception. Indianapolis outrushed the Oilers, 182 yards to 79. Houston gained the most total yards (374 to 288), a deceiving figure since the Oilers were far behind and went to the air often at a point when the outcome had long been decided. There was plenty of sloppy play throughout – the teams combined for 23 penalties, which were almost evenly divided (12 by the Oilers, 11 by the Colts). The ineffective Cody Carlson (11 of 22 for 129 yards with an interception) gave way to backup Bucky Richardson who threw 35 passes with 19 completions for 203 yards and three touchdowns. WR Webster Slaughter had 9 receptions for 77 yards, while WR Haywood Jeffires gained 99 yards on 8 catches with two touchdowns. RB Gary Brown rushed for 39 yards on 10 carries. The big opening day win did not signal a huge turnaround for the Colts, who lost their next three contests, but overall they improved to an 8-8 record that placed them third in the AFC East. The loss did portend bad tidings for Houston, however, as the Oilers went on to a 2-14 finish that was the worst in the NFL. Marshall Faulk ended his rookie campaign with 1282 yards on 314 carries for a 4.1-yard average and 11 touchdowns while also catching 52 passes for 522 yards and a TD. The rushing total ranked third in the AFC, as did Faulk’s 1804 all-purpose yards, and he was chosen as Offensive Rookie of the Year by the Associated Press. Over the course of his 12-year career with two teams, he would come to be recognized as one of the most productive all-around running backs (receiver out of the backfield as well as runner) in pro football history with an eventual total of 19,172 yards (12,279 rushing, 6875 receiving).